Starburst slot - 55 no deposit free spins on Casino Cruise! Exclusive offer! Casino Cruise is offering 55 NO DEPOSIT free spins on Starburst, the most appreciated NetEnt Slot! Any winnings from free spins will be credited to your real money balance, 40x wagering required. 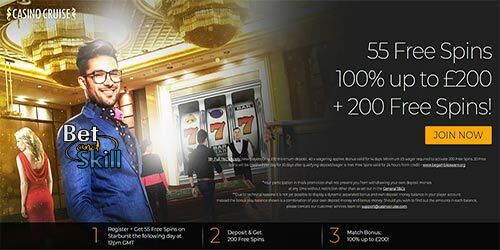 Plus, you will receive more free spins on your first deposit and a 100% bonus up to €/$/£200 and 200 extra free spins! What are you waiting for?!? Casino Cruise will add your 55 free spins on Starburst the following day at 12PM! And as soon as you make your first deposit, you wil get 100% extra up to €/$/£200 free - PLUS 200 extra free spins on Starburst! Casino Cruise, winner of the 2015 Best Newcomer Award, features the best online slot machines, table games and ever-growing jackpots. Whether it’s slots, Online Roulette, Blackjack, Poker Games, live games or something else, you have access to over 1,200 (and rising) of the BEST online casino games from the very best providers in the industry! With their thrilling mobile casino, you can literally take Casino Cruise with you wherever you are! Don’t miss these exclusive offers designed to create awesome new customer experiences. Welcome aboard! Can I get more free spins with no deposit needed? Feel free to claim all the bonuses you like! 55 Free Spins on Starburst slot Game, No deposit required. Players from Canada will receive their free spins on Lady of Fortune game instead of Sturburst. Free spins will be given the following day after registration and will be credited by 12pm GMT, and will be available for 72 Hours. All Free spins winnings need to be wagered 40 (forty) times before the Bonus Balance can be converted to your real money balance. Players' winnings from No Deposit Free Spins Bonuses can only be withdrawn following successful deposit via their preferred available withdrawal method. If this deposit is not made within 7 days of your last game session, then these winnings will be cleared from your player account less the maximum withdrawal amount you are entitled to under the terms of the specific promotion. Maximum withdrawal amount from any free spins winnings, including money won by leveraging the free spins profit, will be no higher than AUD/CAD/$/€/£ 100. Players from the following countries are not permitted to receive the free spins unless otherwise stated: Lithuania, Belarus, Latvia, Czech Republic, China, Bulgaria, Poland, Bosnia and Herzegovina, Republic of Moldova, Malaysia, Georgia, Philippines, Kazakhstan, Vietnam, Thailand, Indonesia, Nigeria, Bangladesh, Mongolia and Ukraine. "Starburst slot - 55 no deposit free spins on Casino Cruise! Exclusive offer!"